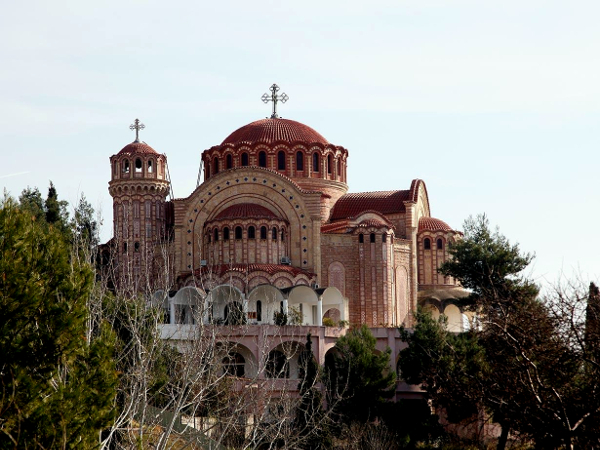 The cathederal of Lamia was representing the traits of greece. Imposant in size, it was catching the eye of one approaching it already from afar. Rich ornaments, fresco tiles and mosaics with pictures of the saints, apostles, aristotles and christos are embedded into the many facettes of the walls. Marble statuettes and rich artistic ornaments showing the fine art of the best stonemasoners of Greece creating a palace to honor the Most High and celebrating the faith in him. The roof is covered with red chindles a visible sign that differentiates the cathederal from any other building in the area. The pillars of the various aisle corridors are made of marble. In front of the highest terrace aisle corridor one was able to oversee a large square of marbel and in the center of it a mosaic with the arisotelian cross. Not only outside but as well inside the cathederal was astonishing to those who enter it. The main halls high ceiling is showing scenes of the book of virtues. The large windows and the light inside of the cathederal were a perfect orchestration creating a special atmosphere within the hall enlighting the mainaltar in perfection while still giving a special light to the smaller altars aligned to each side of the main hall. Not everything was obvious to the common believer while being inside of the cathederal, some of the rich details were perfect optical illusions that created a feeling of divine perfection. The many levels and various parts of the cathederal served all the purpose to create a unique impression to anybody visiting this temple of the Most High. Kalixtus loved the sea. The waves that let the ship from Senigallia glide over the Mediterrenean Sea. He loved the colour and the splash of water that wetted the cardinal's symmetrical face. The three-master he had chosen for this crossing came from the fleet he had anchored in Senigallia. The "Oblivion" was a proud ship and took up speedy passage as the wind was favourable. Kalixtus had the large cabin at the stern of the ship as his own, but he did not work when he sailed across the sea, he breathed, he laughed and absorbed the impressions that this journey exerted on him and also when the weather changed and the ship fought against high waves Kalixtus stood at the bow of the ship in his fluttering white robes with the turquoise hems. He feared nothing and least of all the sea. Then when the first Greek islands came into sight Kalixtus remembered that it had been many years ago that he had been in this area of the world and he had missed it so much. The Greek people was one of those who had survived over the millennia - here you breathed in and out history as well as knowledge. He would find here in the country in which the old apostles had already worked one or the other discovery so much was for sure. For the moment, however, he had arrived on official mission and the Aegean bloomed in the most beautiful colours as in his memory - perhaps even better. But the journey, even if arduous in this time, is worthwhile and so his ship sailed into the Gulf of Malia to the port city Stylis, because this is the closest port to get to Lamia, which was deeper in the Fthiotida, even if only half a day trip. He would enjoy it and already when he left the ship he was greeted inevitably with the hospitality of the region while his crew would remain on the ship, it was Planaxis to distribute the suitcases to the entourage. The carriage as well as the necessary horses had been on board, because he was not sure whether he would have had to travel in the outlying region at the end on a donkey to Lamia. Looking back, it would have been a very funny undertaking. But so it was secured and during Planaxis all this watched over, which would take a while, the Cardinal sat down on the quay wall and watched fishermen patching nets and there comes the said hospitality into play, as the arrival of the Cardinal had apparently got around and he was now offered the regional delicacies as well as a good drop of the house and he was already tempted to be registered in the golden book of the city, there Kalixtus was surrounded by all sorts of people who thought to celebrate his arrival like a feast. Of course in the sense of the Cardinal, who had far too little time for such idleness. In any case, at some point Planaxis had the opportunity to "free" the surrounded Cardinal by dancing his way through to him. So Kalixtus had to say goodbye with a heavy heart and start his journey to Lamia, not without waving and two baskets with food and a big bottle of wine which he was quite into. In the carriage he still giggled while waving out the window and people waved back. In one hand he held a white flower he didn't know, but a young girl had given it to him. Planaxis rolled his eyes as he found his master so amused. What? Kalixtus smiled and tasted the sweet pastry again. I love this country. The carriage found its way to Lamia and over Lamia the big church was enthroned - that will please Jolieen. It had been a good decision, albeit a little in her own interest, to give her a In Partibus here. It took her a while obviously to understand the impact of a parchmant out of the hands of the chancellor of the papal chancellery telling the will of noone else but the Pope. Honor was the opposite of pride and that was what the young redblond woman felt when she received that call. A call for a duty that was asked from her - to be the shepard of a diocese far away from Scotland. But Christos was clear about such things, we have had to give ourselves completly. If our families and friends would not accept our doings on behalf of the Most High, we should pray for them as they are surrounded by the claws of the creature without name telling them to be selfish. Being present, aware and and most of all active was something that kept pulsing in her young veins. A culture of communication and listen to those around her - all this asked a lot. Not to think of oneself too much, but serving the purpose of the Most High. She arrived in Lamia and was welcomed by in a carriage from Rome. Getting used to the fact that she now had other options to travel, as she had as well the duty to represent her rang within the Holy Aristotelian Church and the sociaty of Lamia. But she was aware of this and adapted quickly. A progress that would certainly find its end durring her enthronment. The carriage was richly decorated with the diocesan arms of Lamia. The people looked astonished each time the carriaged passed travellers who lived in the area. A herald was busy announceing the news of the arrival of the new bishop. Lamia had been without such for a longer while and that made that urge inside of Caillen even bigger to serve the good people of this area as a shepard and guide along their path towards the solar paradise. Guidance is often needed, a word of huge importance that weight tons in the essence of the aristotelian belief, but she felt that in many places of the world such guidance was obused, blurred and interpreted by false beliefs that made it easier to serve as a shepard, maybe more convienient and more lazy than it should be. But she refused such blurred messages, and she would not bend down to such doings. She was convinced friendship would overcome such doings on the long run. There was a reason she travelled immediately to her diocese, as one could only judge and make decissions upon things one knew. Making judgements without having seen a perspective thing or without even talking and actively trying to understand a person concerning such thing, was nothing that appealed her own way to execute her office. Greece was surprisingly friendly, welcoming and liberating different to what she was used to. A spirit and willingness to change and set things into motion, learning about how things really are and trying to understand the essence of it. Making friends was easy, talking to people and getting to know their habbits was a way to understand the culture itself. A young acolyte catched her eye, Evros was a good servant within the cathederal and familiar with all who kept the diocese running although it had been without a bishop for so long. Caillen deemed him to be her personal disciple, secretary and in a way servant. Soon the diocese would welcome cardinals and she gave all necessary orders to make sure there was nothing missing to make a good first impression on those who have most likely seen all richness of the world already. Yet she wanted the cathederal to be in its best shape, to make a propiate first impression that would norish not only the eyes of the cardinals but as well the Most High. Evros made all necessary arrangements, as well as he made sure that not only the new bishop would find a suitable logia to spent the days in Lamia but as well the Cardinals. While Caillen started to study the parchments and documations about the current status of the diocese, she sat out on a large terrace, next to her some olives and a good wine. Kalixtus smiled as he now looked around. The area was simply beautiful and you could do so much that was impossible at home. Nevertheless it was clear that when you go on holiday everything is beautiful but when you work here it's just work. He knew that, because he lived where others go on holiday. You are always asked if and how and when you do all the nice things. The truth is, you never have time. So today was actually also such a day - a bit of work, a bit of free time. You have to sweeten things, that was the plan and that's what it's all about. He got out of the carriage and Planaxis would take care of the luggage when a young boy named Evros approached him. He greeted him and looked a little like a young Gangymed. That was acceptable, the Cardinal said more to himself than to the public, although Planaxis of course already rolled his eyes and Kalixtus threw after him - I saw that. Then he smiled at Evros. Announce my arrival so that your mistress may appear to bring me into the house while I look at the church. Kalixtus observed how the boxes and chests came from the carriage slowly to the forecourt. As always you travelled with great entourage as it seems. Kalixtus' gaze glided gently from the scenery and his gaze got something more serious, something more thoughtful. Gently he stroked over the pattern of the red brookstone that was used for the dome. It had this beautiful colour after Italian terracotta - although perhaps it was a little lighter. He entered the dark church which was flooded by cones of light that fell from the impressive main dome onto the floor mosaic and frescoes. A shame that this jewel stood empty for so many decades. It was good that this would now change. They would bring back the suspended regions and reconnect them to Rome. It was and is the most important mission of our days to spread the word among the good people. Here in Greece where so much began, so much developed. That was a special concern. He stepped to the altar and lit a prayer candle before kneeling under the cross and searching here in the land of Aristotle for conversation with him and with God. .... See what wonders the centuries have endured. See what work was done. See what work must be done. To draw strength from the wisdom of your words increases this lonely and yet so full world of miracles. I know the mission on which you sent me all those years ago and I do not despair. I fight to my last breath. I tremble and burn in the fire of your eternity. I look to you Father and I wonder if I will have the strength to protect all the good things. Will I have the opportunity not only in words but also in deeds to praise your greatness and glory and to defeat the demon. Will you stand at my side when my end has come, whether in dignity or in shame? Still it is the questions that touch me and still it is your answers that guide me. Stay at my side and console me in the dark hours of my sins. My God. Evros hurried through the aisles of the buildings, knowing that a cardinal is not deserving to wait too long. When he stepped onto the terrace, Caillen put down the parchments she had been studying, nodding to Evros and left for her rooms as she did wish to make an impression worthy of a bishop, worthy of someone who had learned much within a short period of time. Servants helped her pinning up her blond-red hair in an artistic manner before she got dressed in way richer cloth than Kalixtus knew it from her. Change does not stop at oneself, was what she was thinking. Progress did not stop on herself, this meeting was about to proof her progress in all possible facettes. Evolving from the simple faithful girl from Scotland to the bishop and student of a roman cardinal. A rich embroided darkgreen vestment was choosen, a belt around her waist that gave her body back the shape of the woman she was. Evros did not fail on reporting her the way the cardinal arrived and what he had already arranged, that the Cardinal seemed to be in a good mood and brought with him plenty of lauggage, at least plenty to the eyes of the acolyte. The young greek did not fail on telling Caillen that he felt eyed by Kalixtus. "We are all eyed by his Eminence, nothing will ever miss his eyes, but not only to his eyes. "she replied before she made a gesture to leave for the cathedral. Following the directions of Evros as the aisles of Lamia were still new to her, she stepped through a hidden staircase inside the cathedral which allowed her to step in from the left side corridor. The voice of the cardinal echoed from the walls. Evros remained close to the door in order to be of service if he was needed. Stepping out of the shadow into the light her hands made the sign of the cross towards the altar before she kneelt next to the Cardinal bowing her head for a prayer. It was not upon her to start the talk, just a soft smile was visibly on her face as she was actually relieved to see Kalixtus here. Asside of his birthday this was the first time outside of Rome that both meet. Nothing did happen without a purpose of that she was by now assured, the odds would tell sooner or later if the reasons for their meeting were good ones. From the corner of his eye he saw the shadow that came upon him from the darkness. But even before he saw her he recognized her scent - it was the pines of an old forest surrounding her that enveloped her and that she was for him. Forests and meadows in gentle mist covered hills. Even today she wore green like the dress of her homeland, but he can see that she is transforming. However, he also saw more responsibility than that, he saw the germination of what he had seen in her from the beginning. His prophecy is fulfilled as ever. It had been like this for many years now. He granted her insight into his soul, because whoever observed him at prayer recognized the reality and fear of God which expressed in Kalixtus in awe. He finished his prayer - Hold your protective hands over those who love you and those who must first learn to love you. Kalixtus opened his arms and inhaled the ether, the real presence of God, as he closed with an Amen and crossed himself again. Then he rose and looked across Jolieen to the young Greek. Kalixtus smiled and then looked at her after a blink of an eye. You choose skilfully. But that already rested in you. As I can see, you are already building your system. He slowly walked out of the church not without taking another look at Evros before turning back to her. He will follow them he was curious and he would surely have a lot to learn. At the forecourt of the cathedral he saw that Planaxis had finished unloading and he was holding a wooden box in his hands. He once again noticed that the veins were sticking out there, like small rivers running through his strong hands. He smiled - we'll need that later. We can certainly freshen up a bit. I have here two gift baskets from the locals at the harbour we surely want to taste it, don't we? Let your kitchen present a small selection of them while I freshen up in the bathroom. He left it to her to give the appropriate instructions and show or have the bathroom shown to him. The prayer continued and she understood this gesture of intimacy. In some ways he made himself less distant as he could appear at times. Not the strong, flawless cardinal, that is striving for perfection. This was a precious moment, as he allowed her to see that there was not only perfection. It taught her a valuable lesson as in every tiny bit there was something to learn. He ended his prayer and she followed his example and crossed herself as she stood up again. The redblond noticed that the eyes of the cardinal catched Evros. "It is a never ending circle we need to spread our wisdom and need to teach the word. While you have almost already reached the top of the pyramid I help building the step underneath me and each step needs to be stronger than the step before"
The young greek, was too aware of the eyes of Kalixtus it did make him insecure and although he was usually silent character who did know how to keep most of himself hidden to the eyes of those in front of him, this insecurity did show. He bit his lips and stood there as if he was petrified before he followed Kalixtus and Caillen out of the church as he was always fallowing the bishop he was serving. Outside Caillen was not really surprised to see boxes and crests, she expected Kalixtus to travel with what was essential to him. "The greek people seem to be hungry for the attention of the aristotelian church. We are here, where the dawn of our belief took place and the bond to the most high is still beating strong in them, it only needs a bit of attention" she summed up how she experienced the locals. The presents of those who have met the cardinal were just another proof of her theory. "Apathy from the mother church is never growing strong fruits - the people do strive for attention and every little is rewarded with so much"
Turning to Evros she did not need to speak really, she simply nodded and the young greek gave orders to the servants to take care of those presents with fish and other products of Lamia. Of course the preperations of various dishes was already progressing within the kitchen of the episcopal palace. As this was arranged the greek turned to Kalixtus and lead him the way to the rooms that were designated for him durring the time he would stay. Making as well sure that the servants of Kalixtus got instructed where to find essentials to please the cardinal. "Durring the time of your stay, I will take care of your wishes Eminence and provide what ever you wish." he said in a much shyer voice than usual. He did observe the cardinal and his to him even more impressive appearance. A attraction of the unknown that he could not really understand. The appartment was offering an amazing view over the Golf of Euboa in all rooms, lightflooded rooms with marvel floorings. Aestetically furniture did not disgrace this place, well choosen pieces that reflect the greek way of living. Frescos and mosaiks showing pictures of the creation and the scholars completed the picture a large terracotta terrace on which one could already find chaiselongues, small tables and some sunshades in front of a natural water pool. Two servants welcomed the Cardinal and his entourage offering his Eminence some olives, bread and olive oil, as well as some wine to make sure that Kalixtus would find all to his liking. Evros stayed in order to take care of what ever was needed. Kalixtus said farewell to Jolieen for the moment and did so with a gentle, almost knowing smile. Planaxis followed with a chest containing the precious oils, soaps and tinctures the Cardinal used for his personal hygiene. The chest, carved from ebony, was a gift of Geldern, which was given to him on his birthday with a pair of black swans. With its richly decorated compartments, this chest had been magically chosen for this purpose and packed for this journey. On his way to the chambers he carefully considered the enchanting architecture that had been worked here. It was different from home, you could feel the age and was a little transferred to Rome in the halls of his Palazzo or the one that determined his thoughts. The desire to enjoy Arduino would have to wait. His far falling robes and the peculiarity of Kalixtus to fill a room immediately with his authority and aura could certainly impress the simple observer and Kalixtus was well aware of this effect. Just the fact with which he travelled, with the constant personnel around him all this contributed to his legend but the sun was always surrounded by its planets and their moons. There was a time when he disliked all of this, and now he enjoyed the attention, the admiration, the majesty that was characteristic of him and that even emperors fell to their knees. He had had them all on his knees - emperors, kings and lords of all worlds, Kalixtus was only kneeling before the Pope - but only to kiss him. Gently the Cardinal smiled maliciously then opened his eyelids slowly and gracefully to focus with his ice blue eyes Evros as he did so his own servants approached him and freed him from the many layers of garments, his jewelry. Planaxis, the last one who entered the room, closed the door behind him and grinned. He liked the show because he imagined his filthiest fantasies at that moment and that's exactly what always made Kalixtus look forward to. The first glimpses of his almost perfect white skin became visible as someone unbraided his white hair and draped it with a comb for a short toilet. Whatever I wish? The question was directed to Evros and Kalixtus' amused look was directed to the young Greek. Risky to say this to me, because I usually wish for everything, because I never want to miss anything about anything. Completely naked, he turned to Evros and saw Planaxis making himself at home on the wide bed and his privates straightening out that his size might have caused him discomfort. He stood there overwhelmed obviously by what his eyes observed. Had he ever witnessed someone doing such things, no he was still a young boy with his 14 summers. He was still so full of energy and the desire to learn things and to strive for them. His mind was running fast he could not hide it, as there was some twitching to be seen at the temple of his right eye. He was not able to answer the words of the Cardinal as he was obviously stunned by all this physical desire. A desire only his mind did know for not a long time. Of course the perfect production of Kalixtus did not fail its purpose. The heartbeat of that darkhaird greek was quicker and there was a certain bulge he could not hide between his legs. Looking down and suddenly realising it he turned red in his face. He was not used to his these feelings neither to his own sexuality. Maybe he even had no real concept of sexuality before he had entered that room. But there was something electrical that left no doubt, no room for questions as there was only the will and desire of the Cardinal that would be taken into account in here and it seems as if all his servants knew which role in this game they had to play. Shivers ran through the boys body when Planaxis touched him first. He was obviously a greek like he was and seemed to be enjoying his work alongside the cardinal. He even appeared to be confident and enjoying himself, at least that was what Evros observed. His body was tensed and each touch made him quiver in a way he could not hide it. Was it the sensation? the unknown desire? fear? or maybe simply the mixture of all those things and many facettes more. There was no time to say no; no time to even give that thought of rejection space. And by now he did not even wish to do so. There were hands on his body where he never had felt a touch before. His clothes fell on the floor and he stood there, instinctively hiding what marked him a man with his hands. As a natural shyness took control of his actions. The hair on his skin was almost visible that much he was tensed by the scenery and uncertainty of what would follow next. Caillen left after having given the needed orders to servants and staff to the library. Enjoying the work on some texts she wanted to present to the Saint office at some point. Time should always be used the best way possible and she was in someways convinced the Cardinal would need his time to really "arrive" here in Lamia.